Cities in the Middle East have been on the move for many months now. Not only politics and economy are at stake, but also cultural activities and artistic practice. 10,00-10,10: Welcome, by rector Mikkel Bogh, Schools of Visual Art. 10,00-10,25: “A world in crisis, possibilities for art and culture”. By Carsten Juhl. 10,15-11,00: The projects shown at La Biennale di Venezia 2011 and at Rivoli in Torino. By Aida Eltorie. 11,00-11,20: Discussion of the presentation made by Aida Eltorie. 11,20-12,00: “The Significance of Freedom. To make an essay-film about Cairo”. By Truls Lie. 13,00-14,00: “Jerusalem, the City of Cultures”. By Huda Imam. 14,00-15,00: “The performative, the participative and the rest”. By Georges H. Rabbath inc. skype presentations by Conor McGarrigle (on:Twitter revolutions? and role of social media in popular uprisings from the Arab Spring to OccupyWallStreet via the London Riots), Haig Aivazian (on: art’s ability to actually engage in dialogue with this political moment), Sandra Skurvida (on: Live transmission: the power of the placeless time), Yazan Khalili (on: Presentation around the issue of presentation it self) and two artists Hala Kanaan from Ramallah and Stephanie Nur from Amman. 15,00-16,00: Questions and discussion among all participants, animated by Tijana Mišković. 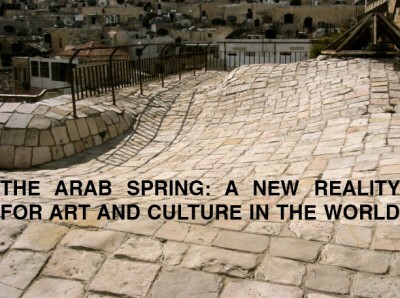 16,00-16,15: “Differences and analogies among artistic positions in Europe and in the Middle East”. A conclusion, by Thomas Locher. Aida Eltorie (Cairo). Artist and curator. Organizer of the Egyptian Pavilion at La Biennale di Venezia, 2011. Huda Imam (Jerusalem). Founder and director of the Center for Jerusalem Studies at the Al Qud University and also director for the Al Qud University Jerusalem Program for international relations. Truls Lie (Oslo). Critic. Editor of Dox and publisher of Le Monde diplomatique. Georges H. Rabbath (Beirut). Visual artist, writer and researcher. Official curator of the Lebanese pavilion at La Biennale di Venezia, 2011, where “The State of Mind” art project was launched. Carsten Juhl (Copenhagen). Historian. Head of the Department of Art Theory and Communication at the Schools of Visual Art. Thomas Locher (Berlin and Copenhagen). Visual artist and professor at the Schools of Visual Art. Tijana Mišković (Copenhagen). Visual artist and independent curator. The conference is open to the public and attendance is free of charge.